The line includes plugs and receptacles from 30A to 400A at 600V. AMPHENOL Industrial Operations has released a line of small and light power connectors. 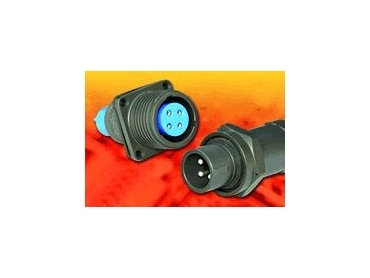 Neptune connectors are designed to provide safe and dependable power interconnects in portable equipment of any type, especially in demanding applications. Neptune is suitable for oil exploration equipment, both on land or offshore, modular power generation equipment, modular manufacturing plants and convention centre power distribution. The line includes plugs and receptacles from 30A to 400A at 600V, featuring Amphenol's Radsok contact system, which allows for more amperage and voltage through a smaller connector. Neptune's lightweight, rugged aluminum hardware is precision-machined from high-tensile strength bar stock and finished with a hard coating to 40 points on the Rockwell C scale. Conductors are readily terminated to easily accessible pressure wire terminals. Cable housings with ample wiring space slip over the conductors after termination, eliminating cumbersome handling and seating of inserts with conductors attached. Armoured and sheathed cable built to IEEE-45/UL1309, IEC, BS, DIN, and JIC standards are compatible with the Neptune connectors, as are unarmoured cables and flexible cables, including S, SO, SOOW-A, W, and G-GC type cables. The contact inserts are interchangeable and reversible to suit specific needs. The contacts are made from copper with standard silver plating and are available with gold plating. The connectors are rated IP-68-8 and have a dielectric strength of 1,800V. Radsok uses the tensile strength properties of the flat, high conductivity alloy grid for the high normal forces required for conductivity, while providing a large conductive surface area. This results in a correspondingly low voltage drop and low temperature rise while maintaining low insertion forces. Radsok sizes used in Neptune are #12, #10, #4, #1/0, #4/0, and #350 MCM.